Foodie Friday Blog Hop: Jiko's Famous Filet with Mac and Cheese | What's the Point? On my last trip to Walt Disney World (I know I still haven't finished my trip report... please don't hold it against me. I will get there eventually) we made a ton of really amazing Advanced Dining Reservations (ADRs). The meal I was most excited for was Jiko: The Cooking Place at Disney's Animal Kingdom Lodge. If you haven't been there yet, you must go! I have always been a little hesitant exploring new types of food and "African-inspired cuisine" definitely scared me a little. However, thanks to a few amazing friends we gave it a try a couple of years ago. The meal was perfect. We had an amazing waiter, we drank delicious South African wine and the food was scrumptious! When my husband and I were making our ADRs this time around all I could think about was my entree from my first visit - Filet Mignon with Macaroni and Cheese. I know it doesn't sound like a "signature" meal, but it's hands down one of the best dishes I've ever had! The African blended sauce on the filet was superb. The mac and cheese is definitely not of the powdered cheese Kraft sort. I'm not even sure what kind of cheese is used. But I can tell you that it melts in your mouth and it is the perfect complement to the filet. So on our last night in the World in December we sat down at the table, looked at our menus and there was no Filet Mignon with Mac and Cheese. Not only was I disappointed, but my parents were also disappointed because I had also been talking up this dish for the six months since I made the ADR. Just before I had a panic attack the waiter came over to discuss the specials. When I asked him what happened to my favorite meal, he explained that the original chef changed restaurants and the new chef wanted to make the menu his own. However, the filet and mac and cheese can be made upon request. 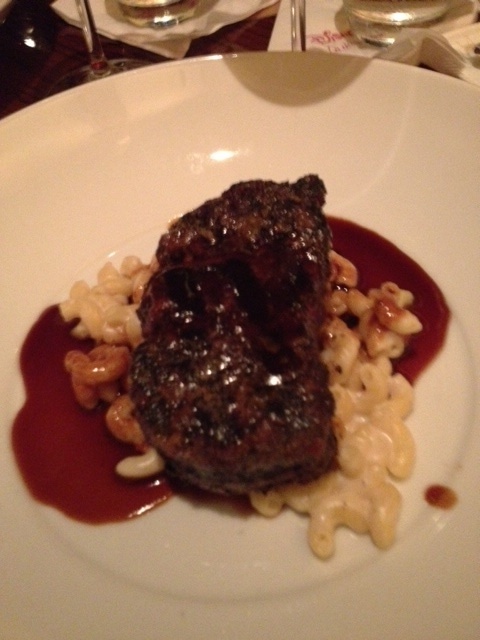 Out of the six of us at the table, five of us ordered and enjoyed the Filet Mignon with Mac and Cheese. It was perfect in every way imaginable. We ate at Jiko for the first time Valentine's day last year. It's now one of my favorite places. You'd never imagine pairing filet mignon and mac & cheese - but that's the genius of Disney's chefs! Thanks for linking up with the Foodie Friday Disney food blog hop! That sounds so awesome, I want it. I will be putting it on my list for next time.. Thanks for the comments everyone! Tricia, thanks for arranging it all! I love these topics, it's easy for me to write! oh noooooo! we were there in May and noticed no steak with mac and cheese so didnt book a table!!! I had no idea you could order it specially!!!! ...not to worry, a good excuse to book another trip! If I were getting the chair, this would easily be my "last meal". It is to die for!! I agree! This is electric chair-worthy! :) Thanks for joining me from Pinterest.